Are you currently in a cosy rental but the idea of a new kitchen excites you? We all know with rentals we are quite limited with what we can and can’t do, this can be a bit of an itch we NEED to scratch – especially after going through all the possible ideas for design and what our dream kitchen would be when we win lotto. Good news is; I have the perfect guide to achieving the feel of a new kitchen without overstepping our limitations. This first step is a bit of a questionable one until you read the reasoning as to why I have added this in, start sprucing up the room by adding a plain, medium sized mirror in the kitchen it does in fact achieve all sorts of visual positivity. It’s an unexpected element in the kitchen so it instantly makes a statement. If you have a window, it’ll help spread the light around. If you don’t have a window, it’ll be even more vital for reflecting what light you do have in the room. Create a temporary splashback in the kitchen, a lot of times rental kitchens don’t have any sort of splashback as they are just done to be as basic as can be whilst focusing on that practicality but whose to say you can’t spice it up a bit? You may need to run this past your landlord, but you can achieve this by using a small cut of a detailed/patterned wallpaper in which you can buy from your local paint shops (& even hardware stores if they stock wallpaper!) super easy yet super fun way of adding a dash of your style, temporally. Boring cabinets? Colour not quite up your alley or isn’t quite linking in with your other colour scheme going on in the rest of the house? Try getting some contact paper, temp wall paper or even vinyl to give your cabinetry a new beginning – just be sure that you can remove whichever product you use without damaging the underneath and, some may need consent from the landlord. Add a magnetic knife block or a utensil wall holder, these are easy to install and can be taken off when you no longer need that – this looks edgy and keeps storage under control. Add some plants to jazz up the positive vibes in your kitchen, plants can uplift your mind set and feel more relaxed – you can even add some herbs and spices so when your cooking up a storm you have this right at your fingertips! Super cute idea and an amazing way to spruce up your kitchen. Don’t have a ton of space do your prep work? Consider DIYing or buying a chopping board that covers your kitchen sink or stove when you’re not using them to add extra space to work. this creates more space and you can store this easily – another advanced option is to DIY your own kitchen island with wheels! look ideas up on Pinterest as there are so many we couldn’t just choose one! Hopefully you feel like your in the next best thing to your dream kitchen in your rental kitchen. Let’s talk fermented food, this is a study health practitioner’s have been really looking into and what they have found is absolutely astonishing . 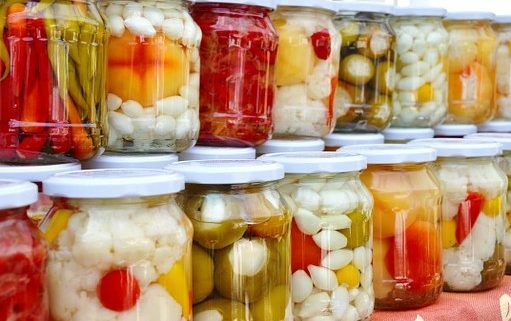 Recently, naturally fermented foods have been getting a lot of attention from health experts these days because they may help strengthen your gut microbiome (the many bacteria and microorganisms that live in your digestive tract). The wonderful health experts and practitioners have been beginning to link these tiny creatures to all sorts of health conditions. The fermented foods are preserved using a process that not only increases the foods shelf life and nutritional value but can also give your body a dose of healthy probiotics which are live bacteria crucial to healthy digestion. Keeping in mind not all fermented foods are crated equal, this means the fermented foods are giving your body beneficial probiotics, this only occurs when the fermenting process is done naturally (doing it yourself seems to be the best way) Live cultures are found in not only yogurt but also in pickled vegetables called kimchi (Kimchi is a Korean vegetable), sauerkraut, and in some original pickles. Typically, the jars of pickles you can buy from the supermarket are sometimes pickled using vinegar and not the natural fermentation process using those important, good, live bacteria – this means the supermarket ones don’t really have any benefits apart from tasting great! Here is a recipe we found online for how-to do this process yourself, feel free to share any recipes you may already know of as well! 1x Carrot cut into rounds. 3x stalks celery (use only small inner stalks from the heart), cut into sticks. Warm the water (don’t boil), stir in the sea salt until it dissolves. Set aside to cool down then add the vinegar. Place your jar in the sink and fill it with boiling water to sterilize. Empty the jar and put all the vegetables and bay leaf. Pour the vinegar mix over the vegetables to fill the jar (don’t fill the whole way, fill it till it’s about an inch from the top). Place the cabbage leaf over the top of the vegetables and tuck it around the edges to hold the vegetables beneath the liquid. Set jar on the bench-top and cover with a special fermentation lid. (you can use a standard lid and loosen it by a fraction each day for the first couple of days just to allow gasses to escape.) Let the mix pickle for three to five days. Check the taste after a couple of days. Vegetables will pickle faster in warmer climates. Make sure the vegetables stay packed beneath the level of the liquid and add salted water (2 teaspoons sea salt dissolved in 1 cup warm water) as needed. When the vegetables are pickled to your liking, seal the jar with a regular lid and refrigerate. Vegetables will continue to slowly pickle in the refrigerator. They will keep for about one month. Taste for saltiness before serving , if desired rinse gently to remove excess salt. http://whangareikitchens.nz/wp-content/uploads/2018/08/pickles-700131__340.jpg 340 511 NEK Accounts http://whangareikitchens.nz/wp-content/uploads/2016/08/logo.png NEK Accounts2018-09-02 01:00:292018-08-28 14:05:01Lets talk Fermented Foods!